We are super happy to announce that we have partnered with FRIEND Farm Animal Sanctuary for the month of October! FRIEND was founded in 1994 when it’s founder Marion bought a disabled lamb at a livestock market. She then decided that all animals on the farm would have a peaceful life. Today, the farm is a sanctuary for nearly 200 animals, including chickens, ducks, geese, turkeys, cows, goats, sheep and an alpaca! 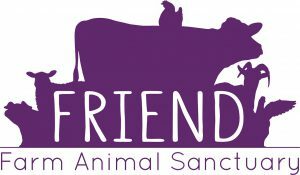 FRIEND’s mission is to offer sanctuary to unwanted, neglected and abused animals, while educating the public about animals, veganism and ecological sustainability. Donations to the charity are spent on food, bedding, essential equipment and veterinary bills for the animals. Throughout October, we will be making specially designed cupcakes for FRIEND Farm Animal Sanctuary with £1 from each sale going directly to the charity. You can find out more about FRIEND Farm Animal Sanctuary here. This entry was posted on Monday, October 1st, 2018 at 1:23 pm and is filed under Cupcake News. You can follow any responses to this entry through the RSS 2.0 feed. Both comments and pings are currently closed.